U.S. equities are feeling the warm and fuzzies on Friday thanks to good news on the U.S.-China trade front and a trial balloon in the Wall Street Journal that the Federal Reserve may slow its quantitative tightening pace. The latter is the balance sheet reduction that was set to pull $50 billion out of the capital markets as years of bond buying stimulus under multiple rounds of quantitive easing are reversed. Late last year, Wall Street had a bit of a panic attack when Fed chairman Jerome Powell suggested this tightening was on autopilot. 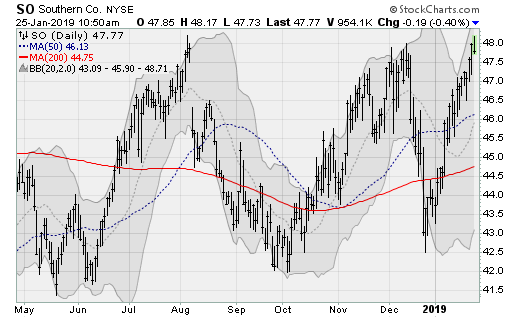 Shares of Southern Company (NYSE:SO), a large utility, are threatening to push up and over a long consolidation range bounced by the $48-to-$50 threshold to the upside. One has to go all the way back to late 2015 and early 2016 for the last time shares were able to push into clear air and hit new highs. The company pays a 5% dividend yield. Management will next report results on Feb. 20 before the bell. Analysts are looking for earnings of 24 cents per share on revenues of $5.4 billion. When the company last reported on Nov. 7, earnings of $1.14 beat estimates by 7 cents per share on an 8% rise in revenues. 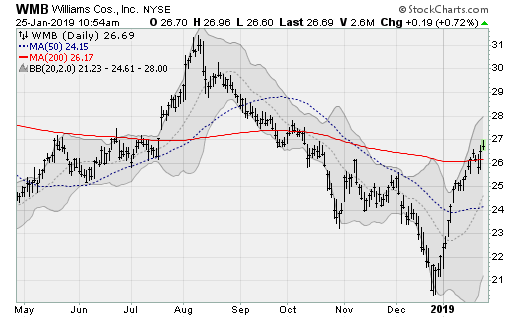 Energy pipeline play Willians Companies (NYSE:WMB) is enjoying a push above its 200-day moving average, its first upside breakout since July that sets the stage for a run at the August highs, which would be worth a gain of more than 16% from here. Although oil prices have been unstable, there is a well-documented shortage of pipeline infrastructure in America’s shale heartland. Notably, WMB also pays a 5.1% dividend yield. The company will next report results on Feb. 13 after the close. Analysts are looking for earnings of 22 cents per share on revenues of $2.5 billion. When the company last reported on Oct. 31, earnings of 24 cents per share beat estimates by 4 cents. 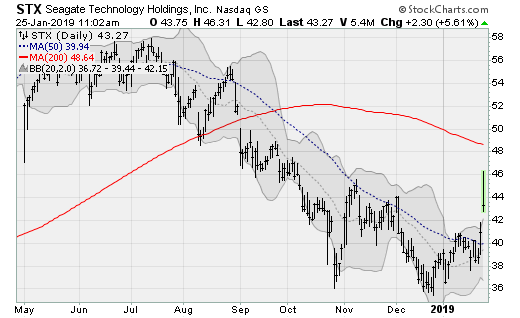 Shares of Ventas (NYSE:VTR), a medical real estate investment trust (REIT), have once again rebounded off of support at its 200-day moving average, setting up a run above the early December high near $64. This could eventually be a test of the 2016-2017 highs near $67. Such a move would be worth a gain of more than 8% from here. Also note that VTR pays a 5.1% dividend yield. The company will next report results on Feb. 8 before the bell. Analysts are looking for earnings of 95 cents per share on revenues of $915.4 million. When the company last reported on Oct. 26, earnings of 99 cents per share beat estimates by 2 cents on a 4.1% rise in revenues. Shares of computer hard drive maker Seagate (NASDAQ:STX) are blasting higher on Friday, up nearly 6%, breaking out of a downtrend pattern that has been in place since last summer. 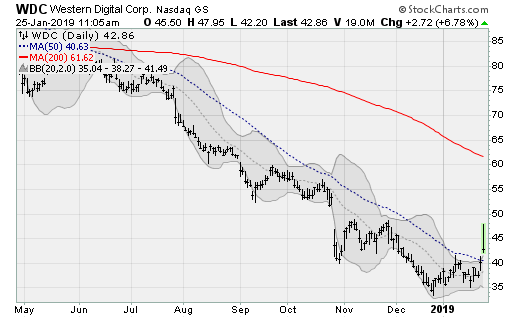 The catalyst was solid guidance from competitor Western Digital (NASDAQ:WDC) that wasn’t as bad as the Street feared. 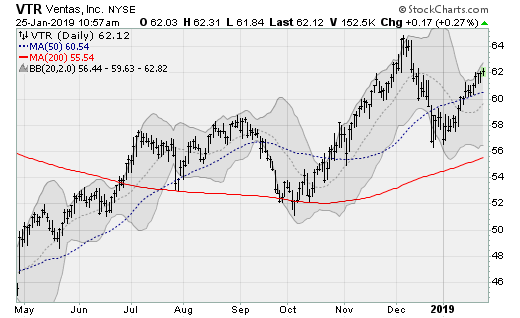 STX shares also pay a 6.2% dividend yield. The company will next report results on Feb. 4 after the close. Analysts are looking for earnings of $1.27 per share on revenues of $2.7 billion. When the company last reported on Nov. 2, earnings of $1.70 per share beat estimates by 16 cents on a 13.7% rise in revenues. Well, we might as well talk about Western Digital as well. Shares are up more than 6% after reporting results — representing more than a full year’s worth of its 5% dividend yield. The company reported earnings of $1.45 per share, down 63% from the prior year and at the low end of prior guidance on a 20.7% drop in revenues. But management was upfront and honest about tepid demand and outlined steps it is taking in response, including lowering production levels and strengthening its product portfolio. In the wake of results, Maxim analysts reiterated their buy rating and $126 price target on evidence of a continued cost leadership position. The post 5 Dividend Stocks on the Move appeared first on InvestorPlace.